In 2018, members of the 115th Congress posted over 500,000 times on official Twitter, Facebook, Instagram, and YouTube accounts. Using Quorum Federal's comprehensive social media monitoring tools, we analyzed the habits, activity, and trending conversations that defined congressional dialogue online. See our full 15-page report for a year-in-review of the most active members of Congress on social media, the top hashtags used by each party, and a preview of the social habits among the incoming 116th Congress freshman class. The average legislator in their eighties was more active on Twitter than the average legislator in their thirties in the 115th Congress. Eighteen members in their thirties, 79 in their forties, 150 in their fifties, 180 in their sixties, 90 in their seventies, and 16 in their eighties served in the 115th Congress. 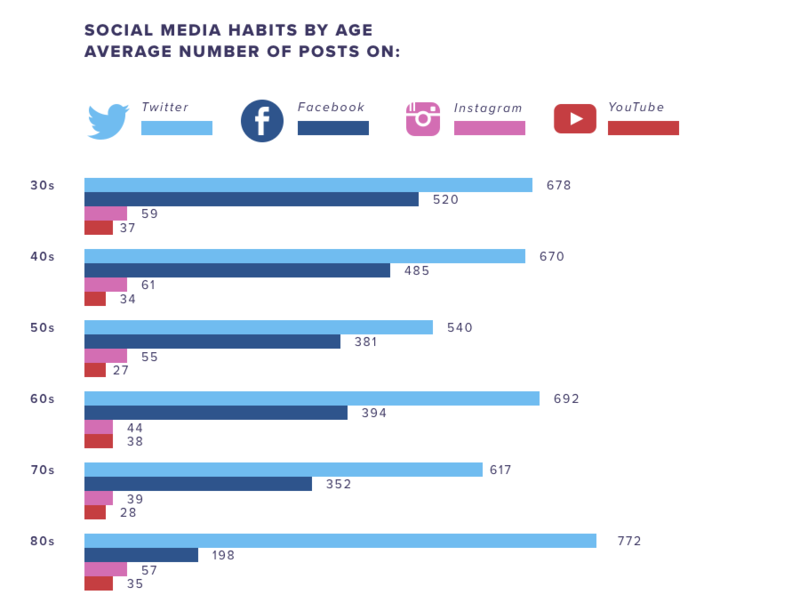 Of these age groups, members who were in their eighties averaged the most tweets per person in 2018. The 772 tweet average was driven in large part by 85-year-old Senator Feinstein (D-CA), 85-year-old Senator Grassley (R-IA), and 84-year-old Senator Hatch (R-UT). Download our full 15-page report to see how many times a day legislators post on social media compared to publish a press release. The top hashtag used by members of Congress in 2018 was #taxreform. 95 percent of the mentions of #taxreform in 2018 came from Republican accounts. Three of the top ten hashtags used by legislators centered around the tax reform debate. The GOP's key policy message, #betteroffnow, ranked #9 compared to Democrats party message, #abetterdeal, which didn't make the top 25. 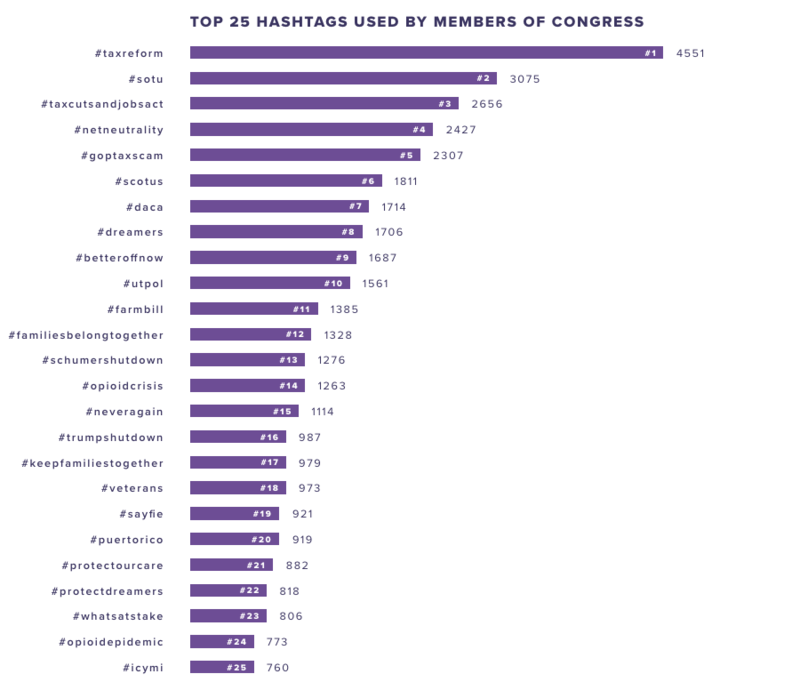 Download our full 15-page report to see the top 25 hashtags used by Democrats and Republicans. 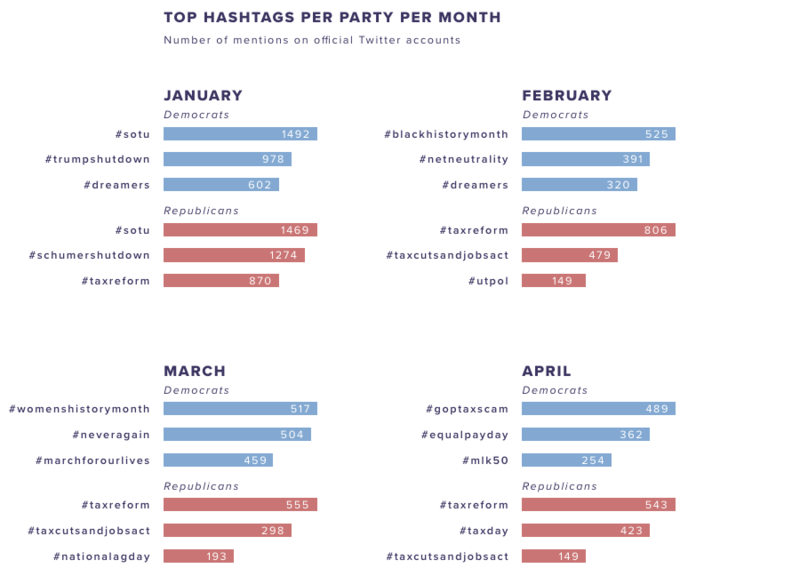 Democrats' top hashtag differed every month while #taxreform was Republicans' top hashtag five months in a row. Download our full 15-page report to see the full calendar of top hashtags used by Democrats and Republicans. The average Democrat in Congress was more active than their Republican colleagues on Twitter, Facebook, and Instagram in 2018. Download our full 15-page report to see the top 10 most active legislators on Twitter, Facebook, and Instagram. 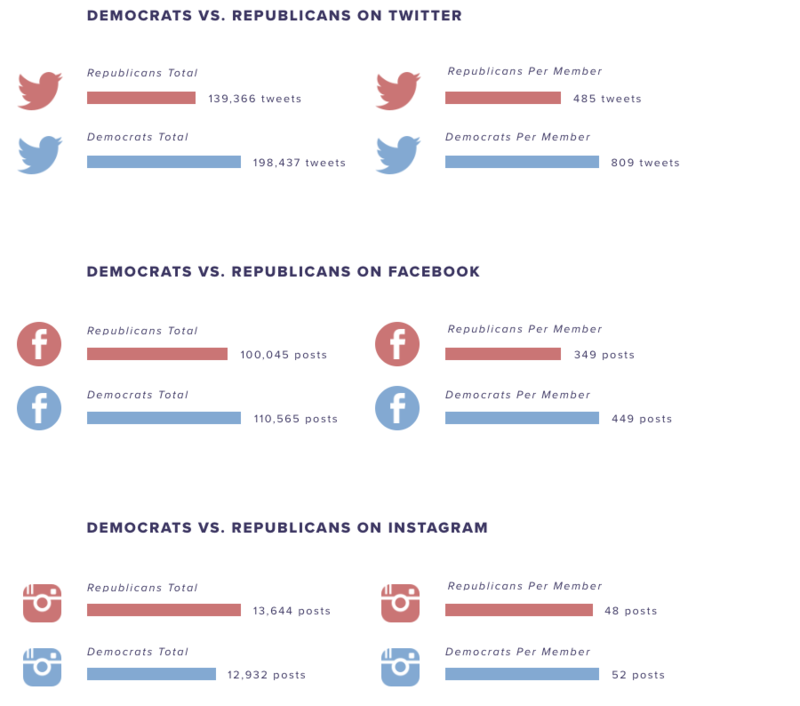 Methodology: Using Quorum Federal, this report analyzes over half a million posts made by members of the 115th Congress on official Twitter, Facebook, and Instagram accounts in 2018. The report covers activity from January 1, 2018 - November 30, 2018. The analysis in the report was made possible with Quorum’s comprehensive social media monitoring and analytics tools. Learn more about Quorum Federal.